During Lent this year I am inviting the Benefice to make a Journey of Prayer. The journey will offer different themes and suggestions of spiritual practices, as well as a ‘menu’ of possible ways for us to engage. The theme of this issue of Connections and this Lenten journey of prayer provide a great connection for exploring the Icon of friendship as an inspiration for prayer (and for friendship!). The icon was ‘written’ in Egypt in the 8th century and the original now hangs in The Louvre in Paris. As an image it has been popularised in recent decades by the Taize community and is easily available in reproduction form. The two figures (friends) are Jesus and Abbé Ména, a Coptic abbot, who has been interpreted as representing ‘everyman’ (person). 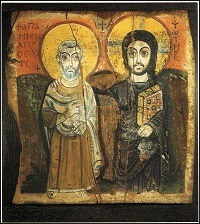 It is easy to see why the image has received its popular title ‘icon of friendship’, as the two friends stand comfortably alongside each other with the arm of Jesus about the shoulder of his companion. I’d like to suggest a few ways in which the icon might inspire us to prayer in its spirit of friendship. First, and most fundamentally, as an image it communicates powerfully that Jesus is near to us, alongside us, with (as it were) a hand about our shoulder. Jesus is modelled as our companion who walks alongside us; who shares our place and space. Friendship can be exclusive, pictured with two faces gazing at each other. However, this image suggests a very different reality – as our friend Jesus looks where we look, and he looks upon who we look upon. Conversely we can be encouraged that in friendship with Jesus we can look at what his eyes of love turn towards – we can see what he sees. The icon invites us to ask where is Jesus looking and what is he telling me about what he sees? Friendship with Jesus is shared compassion, longing, vision, insight, as we gaze with his eyes of love. Perhaps this is a good summary of prayer – to look with Jesus and share his gaze of love; to know that he shares our gaze, that he sees the world through our eyes. prayerfully during Lent. Meanwhile the hand of blessing is an invitation for us to recognise that prayer is the way in which we connect with God’s benediction – the face of blessing for us and for the world. As God’s people we are called to be people of blessing – not in a trite way (“aww, bless”!) but rather by noticing and naming God’s gracious presence and good intention. John O’Donohue’s fine book Benedictus is a master class in such noticing and naming; perhaps in an age of complaint and negativity we can begin our apprenticeship as people of Benediction. Lastly, the icon’s age has worn away the feet of Jesus but the feet of Abbé Ména are shown to be bare. In company with Jesus he treads gently on the earth, and this place and moment of shared encounter is ‘holy ground’. Friendship with Jesus calls us to friendship with the earth – to re-connection and recognition of our absolute felt connection with the rest of creation. We begin Lent with the reminder that we come from dust and shall return to dust – this is not only an expression of our mortality but also a reminder that we are ‘of’ the earth. Praying with bare feet, especially outside, might be a good Lent prayer practice – a practice commended by Barbara Brown Taylor in her excellent book ‘An Altar in the World: Finding the sacred beneath our feet’. As we look towards Lent, and enter it as a season of prayer, I hope it will also be a season of growing friendship. There is an invitation to link up with another or others to enable us to find ways of sharing the journey. Our friendship in faith with each other is inseparable from our friendship with Jesus.